Good morning, Wonderful People! I had to write a quick post about my dream come to life moment last night. After catching up on each other lives and sharing many laughs, we pay the bill and head out. We're walking up Columbus Avenue and when Brandi places her hand on my arm and says "Isn't that the actor...?" I look over to my right. There he is sitting alone and working on his iPad. I immediately stop and make a beeline for the door. 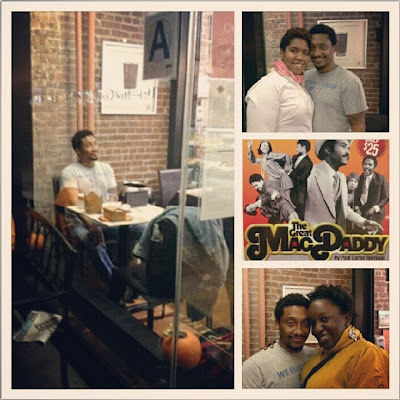 Some may remember Khalil from Juice, Girlfriends, Living Single, or even Love Jones. For me, it was Renaissance Man. I can't began to tell you how many times I watched that movie. Khalil Kain was the first actor that I truly gushed over in a film. Oh and when his character was arrested, I cried. Damn shame I know. I walk up to him, apologize for the interruption and mention that we noticed him as we passed by. After introductions were made, we found out that he's happy to be back in NYC and is currently working on an Off Broadway play, The Great MacDaddy. .
Just goes to show that it pays to be aware of your surroundings. Good looking out, B. Rocka!